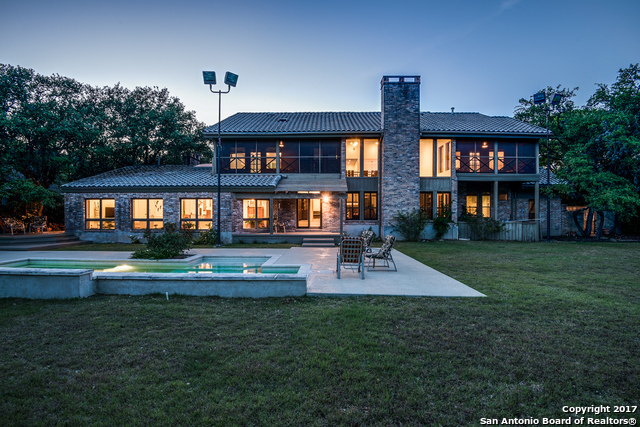 All ELM CREEK homes currently listed for sale in San Antonio as of 04/25/2019 are shown below. You can change the search criteria at any time by pressing the 'Change Search' button below. "Surrounded by lush green trees, this house, is in perfect seclusion from our hectic day to day lives. This home is an oasis, a way of life so luxurious you will not want to leave. Make your way through the driveway, the stone entryway and through the wooden door accented with decorative glass. The reddish brick facade gives a feel of warmth and you embark on this home experience with exquisite finishes like marble flooring, soaring ceilings, chandeliers and completed with a 3 bed, 2 bath guest h"
"Stunning One-Story Retreat in the heart of Elm Creek featuring updated Chef's Kitchen w/ Luxurious Granite Waterfall Island & Painted Glass Backsplash. 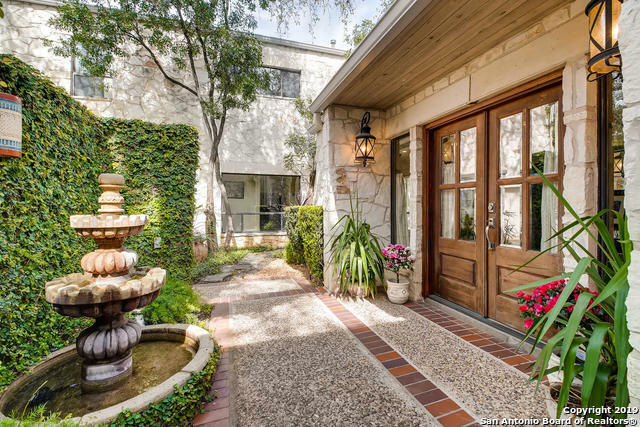 Enjoy 3 Living Areas surrounded by Natural Light & Gorgeous Views of Backyard Oasis w/Pool & Koi Pond! Master Suite w/Sitting Area & Fireplace, French Doors to the Patio, Lg Master Bath w/Sunken Shower, His/Hers Closets & Private Bonus Room for Meditation/Fitness! All Bedrooms feat Private Bath & Outside Access. Study Easily Converted Back to 4th"
"EXCLUSIVE GATED AREA INSIDE OF 1604* UNIQUELY DESIGNED TO TAKE ADVANTAGE OF THE GORGEOUS VIEWS*LOTS OF LIGHT*HIGH CLGS*PRIVATE .45 AC ON QUIET CULDESAC*OVER 6600 SQ FT OF QUALITY*3 LIVING AREAS*LIBRARY*SOLARIUM*2nd LOFT 15x12*HOBBY/WORKSHOP 18X8*MINI KITCHEN DOWN 8X8*SPECTACULAR MASTER SUITE W/ FABULOUS 15X15 CLOSET*GARDEN BATH*STAINED GLASS*ALL BEDRMS HAVE A FULL BATH, WALK-IN CLOSET*PARKLIKE YARD*W/LRG POOL*DECKS*OUTSTANDING LOCATION!!" "This gorgeous Elm Creek home includes an expansive space with inviting details that are perfect for entertaining. The property contains three vast living areas, an exercise room, game room, outdoor kitchen, and a heated pool and spa. Additional features include wood and stone flooring in most areas, custom remodeling, a fully equipped Wolf/subzero kitchen, as well as two fireplaces. The home sits on a beautiful greenbelt as well." 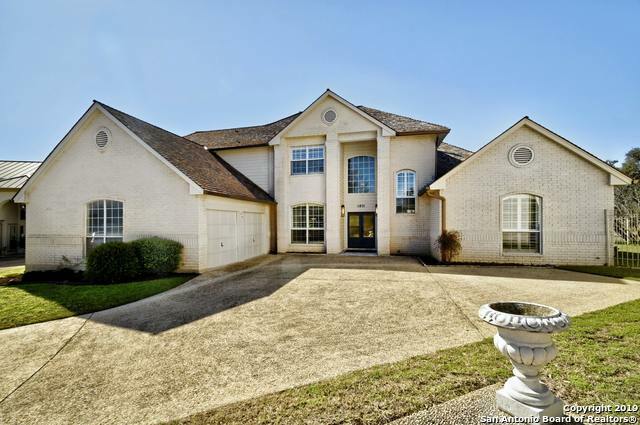 "Luxury in highly desirable Elm Creek! Sitting on a large corner lot and facing extensive greenbelt views. Very private and humongous master suite with outside access and enormous closets. Additional bedroom downstairs. Upstairs are two large bedrooms with private balconies plus a media room. Ceramic tile and wood floors throughout. Gorgeous lap pool and spa invite to enjoy the outdoors. 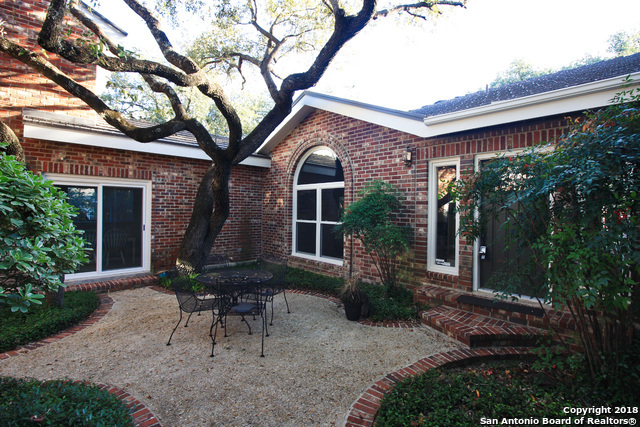 If you are looking for space in a wonderful location in San Antonio, then this home has your name written all "
"'STREET OF DREAMS. Over 4593 SF of luxury packaged in a like new single story TRADITIONAL home in ELM CREEK. Featuring 4 Large Bedrooms plus Study, 3-1/2 Baths, a lavish master bath with Whirlpool, shower, granite counters, tons of tile and gleaming wood flooring, wood windows, a Family Room, Playroom, Separate Dining Room, a custom kitchen, granite counters, a large servicing Island, a secluded enclosed Dining patio, flowering shrubs, trees, a sparking pool/spa. A guard-gated community." "Adorable home in Elm Creek/Man Gated with a pool. INCREDIBLE TALL CEILINGS & FIXTURES W/ALL THE FINISHES! 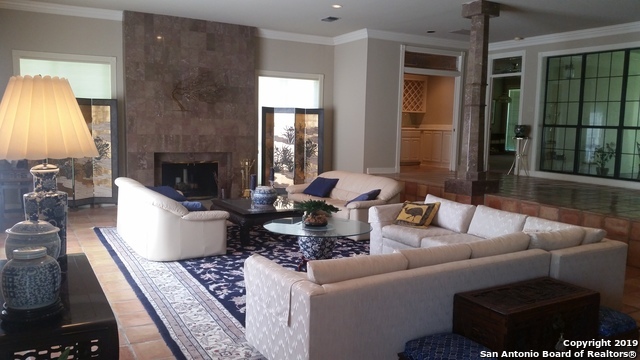 LIVING ROOM, MASTER AND STUDY WRAP AROUND THE PRIVATE POOL WITH WALLS OF FRENCH DOORS. 2 LARGE UPSTAIRS BEDROOMS EACH WITH THEIR OWN BATH. LARGE MEDIA/GAME ROOM. THE QUALITY OF THIS CUSTOM HOME IS HARD TO FIND. Corner lot and private backyard. If luxury is what you looking for, this is it! Master down stairs with the office and the media room is upstairs." "REDUCED: Stunning 1.5 story home nestled inside of the heavily guarded Elm Creek community (F.Y.I. Elm Creek was San Antonio's 1st gated community). This 4/4 has 2 separate Master Baths in the Master Retreat and a sunken Grand Room along with an impressive layout of handmade square Saltillo tile, giving the home a more open & dramatic look. There's even a BONUS ROOM that can be converted into a 5th Bedroom. Exterior features include 2 patios & a water garden. This backyard is ready for your next"
"Luxurious family home, in the guarded Elm Creek community, offers the finest in interior design, spacious living & elegance! 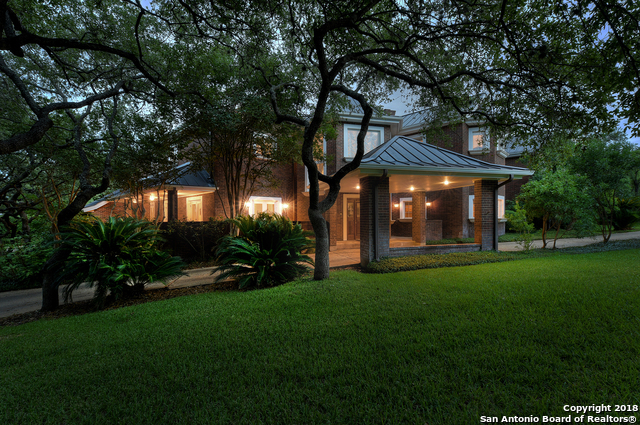 With 2011 renovations, travertine, marble, hardwood & stainless steal made this home captivating! 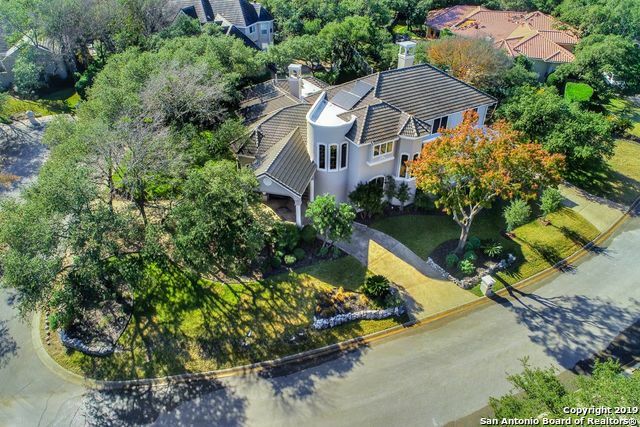 Elm Manor offers 5 bedrooms, 3.5 baths, 2 living areas, 2 dining areas, covered outdoor living, swimming pool surrounded by deck, parklike backyard views, private front entrance, grand vaulted ceilings, island kitchen, built-in appliances & cabinets throughout...see Assoc. 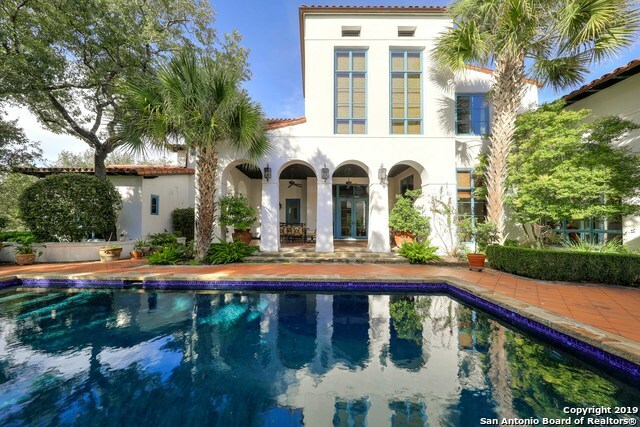 Doc"
"VACATION at Home in this Elegant R. Kenigstein Mediterranean Garden Home. 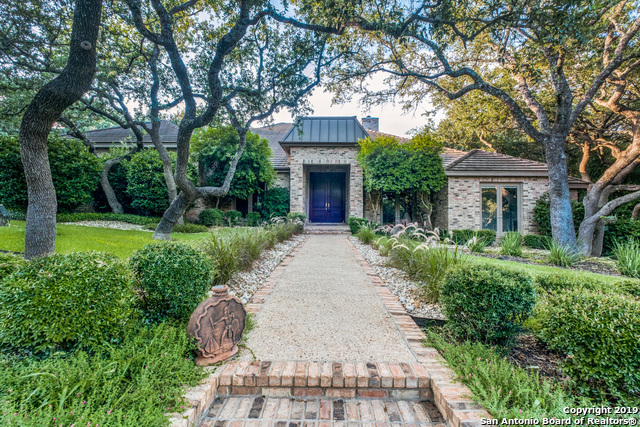 It is nestled upon an elevated, oak-studded corner lot and has a handsome front perimeter (stucco) wall to enhance PRIVACY & SECURITY. The entry COURTYARD is the focal point of this unique home with its lovely POOL-PATIO area....Perfect for solitude (MB access) or festive gatherings. Truly a one-of-a-kind JEWEL." "You'll love the serenity of this beautiful home backing up to Elm Creek Park. Current owner redesigned and updated this versatile home and did a fabulous job! Executive kitchen has quartz tops, large and plentiful custom cabinets, country sink, 5 burner gas cook top, and exit to back yard. Room off Master can be used as office, nursery, dressing or exercise room. Only step in main level is to laundry room. Second master up with its own bath. Plantation shutters on all windows. Pool plans are ava"
"OUTSTANDING ELM CREEK HOME WITH MASTER AND SECONDARY BEDROOMS DOWN - POOL/SPA - TONS OF STORAGE - RECENT UPGRADES INCLUDE: - NEW HARDY PLANK - VINYL WINDOWS - WOOD FLOOR - RECENT HEATING/AC UNITS X3 - SPRINKLER SYSTEM UPDATE - REVERSE OSMOSIS SYSTEM - STAINLESS APPLIANCES IN GOURMET KITCHEN - GRANITE COUNTERS - LUXURIOUS MASTER RETREAT WITH SPA-LIKE BATH - THIS ONE TRULY HAS IT ALL. PERFECT ELM CREEK LOCATION - PERFECT HOME - CALL TODAY FOR MORE INFORMATION AND A PRIVATE TOUR." "Great Family Home in the Gardens of Elm Creek. Open Floor Plan W /Plenty of Bright Light due to the Sky Lights thru-out the House. Custom Built W/4 Bedrooms, each having it's own Full Bath. Three Beds Downstairs/3Full Baths. Upstairs is the Guest Bedroom W/1 Full Bath. 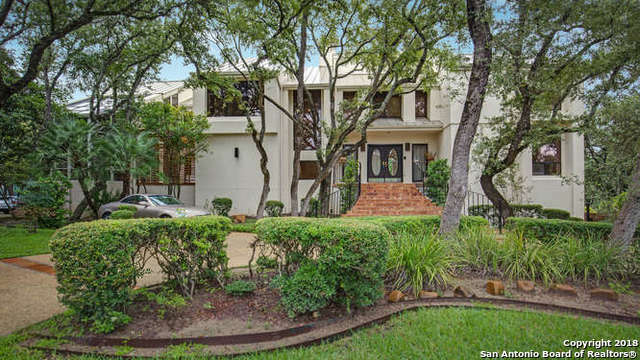 Centrally located with easy access to IH 10 & Loop 1604. Close to the Medical Center, UTSA Guard-gated, 24-hr Security. Low-maintenance lifestyle w/small yard provide a great lock & leave home. ."